Piazzale Michelangelo | Travel to Florence.com, your online travel guide. Piazzale Michelangelo offers one of the most panoramic views of the city of Florence, Italy, perched high above the River Arno. You can sit at this wonderful public plaza and take in the breathtaking views of the river, the city and the mountainous landscape in the background. Be sure to take your camera, there are few views like this one. Sitting on a hilltop, high above the Oltrarno neighborhood of Florence, it places you on even ground with the roof of the Duomo Cathedral, which is across the river. You can see one of the most beautiful sunsets ever in Florence, Italy. A view like the one from this plaza, dedicated to Michelangelo, is normally only possible from a helicopter ride. There are replicas of statues sculpted by him, including a bronze David statue. Piazzale Michelangelo is free to visit. There may be an occasional food cart or souvenir vendor, but it is a prime location for couples to share a romantic moment together, have a picnic or just hang out and take in the beautiful view of the city from afar. There are plenty of quiet spots to get away from the large crowds. It has a serene quality about it, as you can see many famous landmarks from this plaza area. No matter what the weather- rain, overcast or sunshine, Piazzale Michelangelo offers distant views unlike any other plaza in Florence, Italy. Built and designed in 1869 by architect Giuseppe Poggi, it is a tribute to Michelangelo and his works. As part of the restructuring of the city, he built a monument base to be composed of Michelangelo's works including David and some of his work from the Medici chapel of San Lorenzo. When he finished the terrace, he designed a hillside building which is now a restaurant and museum of Michelangelo's works. It's a great place to grab a bite to eat or a glass of wine, while enjoying the view and looking at the sculptures. 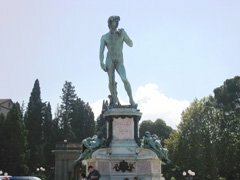 While you can walk up the long hill, which is followed by some steep steps to the Piazzale Michelangelo, you may chose to drive or take the bus to the plaza. There are two buses that leave from the train station and make a circular route up one side and down the other of the hill to give you a variety of views, and some memorable photo opportunities. If you are really energetic, you may want to keep climbing to the very top, where there is a church, San Miniato al Monte. From there, you get the best views and there are no crowds, not too many people know about it and the ones that do may not be up to the climb. On your way back down, you can stop and grab a glass of wine at Fuori Porta. 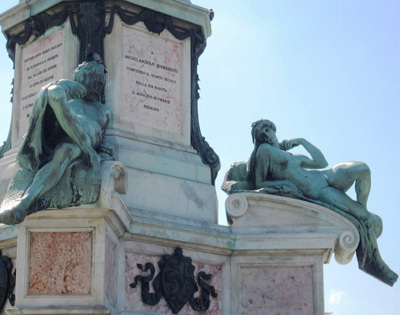 The Piazzale Michelangelo is truly one of the best bargains in Florence, Italy. If you are in good condition, you can climb on up to the church. The trek is worth it; maybe ride the bus up to save your energy for the best view in Florence, Italy.